MIND has long been a leading journal in philosophy. For well over 100 years it has published the best new work in all areas of the subject. The journal continues its tradition of excellence today. The journal aims to take quality to be the sole criterion of publication, with no area of philosophy, no style of philosophy, and no school of philosophy excluded. Each issue also contains a selection of book reviews that summarize and evaluate some of the most interesting recent publications in the discipline. Dr. Smith is a wartime medic. Five injured soldiers are in critical need of organ transplants: one needs a heart, two need kidneys, and two need lungs. A sixth soldier has come in complaining of a toothache. Reasoning that it’s better that five people should live than one, Smith knocks out the sixth soldier with anesthetic, chops up his organs, and transplants them into his five other patients. In the chaos of the war, no one ever finds out. Does Smith act wrongly? It seems to me that Smith has done something wrong. This feeling of mine is not the conclusion of any explicit argument. Instead, I just reflect on this situation and find myself with the intuition that Smith’s act is wrong. On this basis, I conclude that morality does not always require us to bring about the best outcome. It is better for five to survive than one, but it’s not permissible to murder someone to bring this outcome about. Here, I use my intuition as evidence for a philosophical claim. I start with a claim about how things seem to me, intuitively, and I move from there to a claim about how things actually are. This is one of the primary ways in which philosophers answer questions about reality and our place in it—we think carefully about hypothetical scenarios or abstract principles, and see what claims then seem to us to be true about whether an action is immoral, or when our actions are free, or what we can know. Or at least, this is the received view about philosophical methodology. In recent years, a number of philosophers—including Timothy Williamson, Herman Cappelen, Max Deutsch, and Jonathan Ichikawa—have challenged this view. It’s not that they think that intuitions aren’t good reasons for philosophical beliefs. They think that we don’t use intuitions as reasons for philosophical beliefs in the first place. These philosophers maintain that in a case like the above, I don’t treat my intuition that Smith has acted wrongly as evidence that morality doesn’t require bringing about the best outcome—instead, I treat the fact that Smith has acted wrongly as evidence for this claim. To think that we use facts about our mind, rather than facts about the world, as evidence is to wrongly psychologize our reasoning. I think these critics are wrong. Many aspects of philosophical reasoning only make sense if they involve using intuitions as evidence. For example, this is the easiest way to explain the fact that in the above example, my intuition and my belief coincide: I have an intuition that Smith acts wrongly, and I also believe this. While philosophers sometimes reject their intuitions, this is the exception rather than the rule: most of the time, we act as if we expect our intuitions to be a guide to the truth. Many aspects of philosophical reasoning only make sense if they involve using intuitions as evidence. When philosophers don’t go along with their or others’ intuitions, they often offer error theories for those intuitions. These error theories are supposed to explain away intuitions contrary to their own beliefs. A philosopher intent on maintaining that morality requires bringing about the best consequences might try to explain away my intuition to the contrary by arguing that while Smith’s action was right, in most similar cases, there would be very bad consequences to doctors killing patients to harvest their organs (for example, if this became common, people would stop going to their doctors). The reason it seems to me that Smith acts wrongly is because I am confusing Smith’s situation with these other similar situations in which organ harvesting would be wrong. The practice of offering error theories only makes sense if we think intuitions are evidence. In offering the error theory above, this hypothetical philosopher is tacitly acknowledging that my intuition would be evidence for my belief, were this contrary explanation of my intuition not available. If we could not explain my intuition by my confusing Smith’s action with similar actions, the best explanation of my intuition would be that it is based on perception of the actual moral qualities of Smith’s action—I believe that Smith acts wrongly because I have a moral sense that leads me to understand that in a situation like this, Smith’s action does not meet the demands of morality. Why does it matter whether philosophers use intuitions as evidence? It matters because we want to make sure that we are reasoning responsibly. If we use intuitions as evidence, it is incumbent upon us to ask: are we right to do so? Are our intuitions about knowledge, free will, ethics, God, and so on, actually reliable guides to those subject matters? Are the ways things seem to us correlated with the ways things are? In answering these questions, we have to also take seriously the challenges of skeptics who purport to show that our intuitions are not reliable—whether because they are shaped by evolutionary pressures, biased by culture, or responsive to irrelevant factors, like the order in which different cases are presented. These skeptics might be right or they might be wrong. But the challenge they are raising is one that cannot be ignored, for the use of intuitions as evidence is central to philosophical practice. Featured image credit: “Lost in the Wilderness” by Stijn Swinnen. CCO via Unsplash. Nevin Climenhaga is a research fellow at Australian Catholic University. He received his Ph.D. in 2017 from the philosophy department at the University of Notre Dame, with a graduate minor in history and philosophy of science. 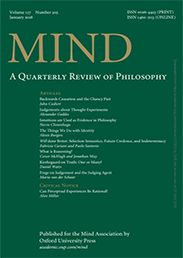 His article, "Intuitions are Used as Evidence in Philosophy," was included in the 2018 Best of Philosophy collection.